Advantages: Continues the often neglected story of the Luftwaffe's transport units including aircraft and operations; concise and interesting narrative; large, relevant photos; great profiles - terrific inspiration for modellers. The Classic Colours Luftwaffe Colours project is an ambitious series of books written by an ensemble cast of some of the best respected Luftwaffe experts from around the world. The focus of the series is the camouflage and markings of Luftwaffe aircraft from the first tentative challenge to the Treaty of Versailles to the last days of the Third Reich. The Jagdwaffe section has recently come to a conclusion with 20 books in that series alone, but Classic Publications still has plenty of ground to cover. 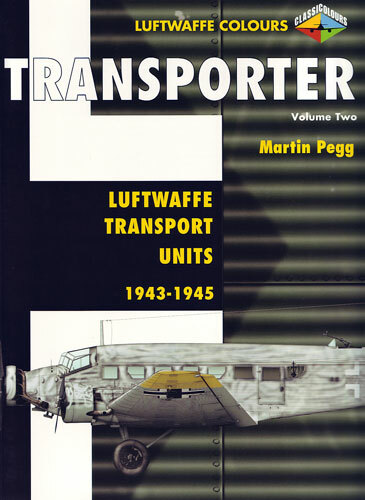 Classic Publications has now promptly followed up the first volume in the short "Transporter" series with Volume Two, covering Luftwaffe transport aircraft and operations from the 1943 until the end of the Second World War. The book comprises 96 pages in the familiar large format (303mm x 206mm) of the series. Around 200 photos, mostly of the aircraft of the period, are one of the highlights of this title. Captions are detailed and relevant, and provide useful information about the colours and markings of the subjects. The side profile illustrations are very attractive, and cover a wide selection of mid to late-war transport aircraft. It is good to see Classic Publications apply its attractive and effective style to this sometimes neglected aspect of German military history. This book in the Classic Colours series is ideally suited to modellers with its many inspiring profiles and its discussion of camouflage and markings.